After months in the making 17 wild horses from Fort Polk , Louisiana made the long journey to Black Hills Wild Horse Sanctuary on Saturday September 15th, 2018. These 17 horses were part of a the May 2018 Round Up, circumstances surrounding this round up are explained in this Article. In summary the May 2018 Round Up consisted of approx. 37 horses. The 501c3 who was working with the army at this time is known as Meridian Falls Ranch. However when Meridian Falls Ranch got the call they were not prepared but rather than telling the army to move to the next 501c3 on their list they decided to accept the Army’s offer even though they did not have the ability to save these horses. So a group of caring individuals got together, took responsibility and worked to save the 37. Sadly only 25 were saved by this group of caring individuals and in the middle of coordinating placement for the remaining 12, Meridian Falls Ranch decided that they would take them, even though we had worked to locate a short term holding location which would have secured their safety. Still to this day the whereabouts of the 12 are unknown, and we fear the worst for them as well as the subsequent June Round up of 32 horses. Meridian Falls to this day has yet to disclose their fate to the public and has in fact removed their social media pages from Facebook. Since May 2018 Round Up there have been subsequent Round Up/Removals in June, July, and August. Round Up Tracking will give you info about all round ups documented under the Army’s COA7 , since its inception in October 2016, to date approximately 239 of Louisiana’s Wild Horses have been evicted from their homelands under a plan that failed to consider the welfare of these horses whose antecedents have ranged on this land for over 150 yrs as well as ethically considering the potential effects on the cultural landscape per section 106 of the National Historic Preservation Act, a complete Environmental Impact Statement, work to find sanctuary with Kisatchie’s 604,000 acres and there should be an organization included whose sole purpose is to protect the welfare of these animals. 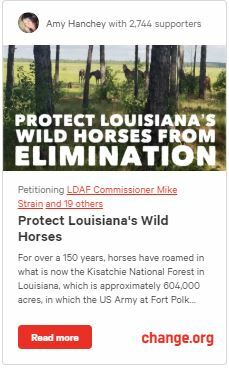 The Civilian led Range Control division at Fort Polk has been ramping up their plan to “eliminate” Louisiana’s Wild Horses despite ongoing litigation which was filed December 2016, including an Amicus Brief filed by Dr Philip Sponenberg speaking to the potential genetic significance these horses have on a worldwide scale. It is crucial that we continue to take action and communicate our disapproval to both Army and Public officials. But today we can all breath a collective sigh of relief knowing 17 will have a chance at a proper life. A Very Special Thank you to Mrs Susan Watt and Black Hills Wild Horse Sanctuary staff photographer, Rianna, for capturing these truly breathtaking photos. So many amazing people and organizations came together to make this happen and without each one I don’t know where these horses would be. Stacey A and Mr Glen and all the staff at SLPAC, Without you it wouldn’t have been possible. Thank you for your heart and dedication. Dr Cramer and staff at Acadiana Equine Hospital , for getting their vet work in order in the most safe and gentle way possible. Special thank you to Kelli Briscoe took the bull by the horns and filled vials, labeled blood and hair samples like a pro!! All our donors who made this possible on such short notice! I can’t tell you how comforting it is to know I’m not alone here, thank each and every one of you. To all our friends, team members, and followers who are always there to help uplift encourage and share the fight to protect Louisiana’s Wild Horses. A super special Thank You to Mrs Suzanne Roy of American Wild Horse Campaign who has helped us beyond measure. Without her this fight would be impossible. Tulane and Animal Legal Defense Fund, your dedication to these Horses is their life line. Thank You to Mrs Jen Reid at Best Friends Animal Society for working to find these 17 a forever home and covering transport! Mr Clay Gilchriest, our hauler, who did an amazing job keeping both the horses and me calm, Bless you! Thank you Mr Joey Dickey for the referral. Next Post Preliminary Genetic Analysis Reveals Fort Polk Horses have Strong Spanish Associations, Unique in Remaining Wild Herds.